When Miriam Cressman, RN, retired after 28 years as a nursing coordinator at Virginia Mason’s Transplant Center, she didn’t really leave. 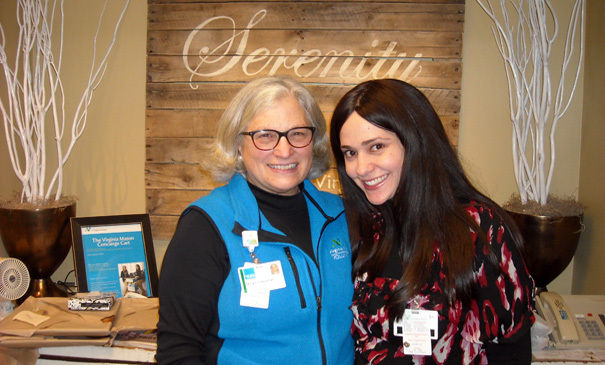 She stayed to volunteer four hours a week at the Seattle medical center’s Serenity Gift Shop. Miriam travels to Seattle from Vashon Island where she and her husband take care of horses, dogs and a large home garden. “The gift shop wouldn’t be able to function without the help of our dedicated and great volunteers,” says supervisor Megan Druckman. “We’re a non-profit and the proceeds support the hospital. We’re all proud we can support patient programs.” The gift shop carries a wide variety of merchandise including chocolates, flowers, magazines, soaps, plush animals, jewelry, candles, lotions, Glassybaby votives, greeting cards and more. Volunteers help improve the patient experience at Virginia Mason and many opportunities are available.